Aadvik Camel Milk Powder 500 gms Welcome this freeze dried milk powder with no additives or preservatives (100% pure and natural). Freeze dried camel milk powder is a rich source of nutrients which will keep you energise for the whole day. Aadvik's camel milk powder is made from pure and fresh camel milk taken from the deserts of India. We work closely with selected camel breeders to ensure that the highest quality of camel milk is delivered. Freeze dried process : In freeze dried process, no heat is involved, hence freeze dried powder has all the nutritional value of authentic camel milk intact. Camel milk powder is easy to store and handle. Camel milk is richer than cow's milk in Calcium, Iron and Vitamin C. Camel milk can be consumed by lactose intolerant people and those allergic to cow's milk. This milk is easy to digest. You can drink it plain, make ice creams, smoothies and other healthy drinks from it. How to make a glass of camel milk from camel milk powder : Add warm water (one glass, approx 200 ML) in a bottle followed by 2 table spoons of camel milk powder. Mix it with a blender or shake it well before pouring the milk in a glass. As an inherent characteristic of any freeze dried powder, a few particles may not dissolve entirely but nutritional value will remain intact. Make 400 ml of Camel milk from 40 gms of powder. Make 1 liters of Camel milk from 100 gms of powder. Make 2 liters of Camel milk from 200 gms of powder. Make 5 liters of Camel milk from 500 gms of powder. Aadvik Camel Milk Powder 500 gms Welcome this freeze dried milk powder with no additives or preservatives (100% pure and natural). Freeze dried camel milk powder is a rich source of nutrients which will keep you energise for the whole day. 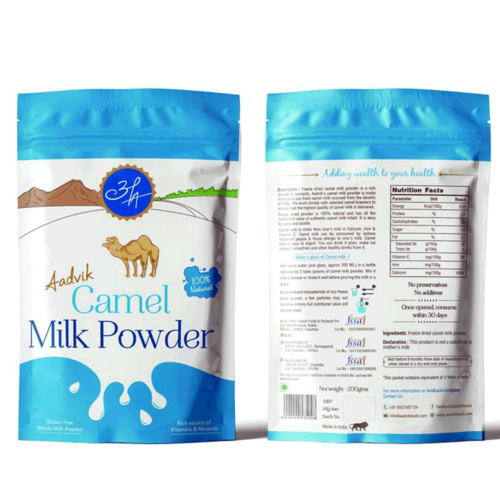 Aadvik's camel milk powder is made from pure and fresh camel milk taken from the deserts of India. We work closely with selected camel breeders to ensure that the highest quality of camel milk is delivered. Freeze dried process : In freeze dried process, no heat is involved, hence freeze dried powder has all the nutritional value of authentic camel milk intact. Camel milk powder is easy to store and handle. Camel milk is richer than cow's milk in Calcium, Iron and Vitamin C. Camel milk can be consumed by lactose intolerant people and those allergic to cow's milk. This milk is easy to digest. You can drink it plain, make ice creams, smoothies and other healthy drinks from it. How to make a glass of camel milk from camel milk powder : Add warm water (one glass, approx 200 ML) in a bottle followed by 2 table spoons of camel milk powder. Mix it with a blender or shake it well before pouring the milk in a glass. As an inherent characteristic of any freeze dried powder, a few particles may not dissolve entirely but nutritional value will remain intact. Make 400 ml of Camel milk from 40 gms of powder. Make 1 liters of Camel milk from 100 gms of powder. Make 2 liters of Camel milk from 200 gms of powder. Make 5 liters of Camel milk from 500 gms of powder.